Ray Milland & wife Mal enjoying a few drinks with friends. Wish I had a date for this, but I'm going to make a guess at the late 40s. As always, check your local listings for exact start times. Also playing that night from the DVD set is: Thou Shalt Not Sin documentary, Night Nurse, Three on a Match, Female, and A Free Soul. "After announcing the names of the five nominees, she [Ingrid Bergman] turned to the man from Price Waterhouse, held out her hand and said, "And now, the envelope, please!" Quickly she tore it open and unfolded the sheet that held the name. A great bit grin appeared on her face. Like a blow to the heart I knew I hadn't won. She was smiling and I'd never even met her. It had to be one of the other four. Then dimly, I heard the words, "Are you nervous, Mr. Milland? It's all yours!" In the applause that followed I just sat there. I never thought to move until I felt Mal's elbow in my ribs, a blow which I still feel to this day when it's raining. My dear one hissed, "Get up there, sweetheart! Get up there! It's you! It's you!" I don't remember much of what happened after that. Everything was a jumble of handshakes, microphones, people with notebooks and pencils, and flashing camera bulbs. It was almost midnight before we could get to our car and pull away from the theater and head toward the Restaurant La Rue, which Paramount had taken over in anticipation of winning a few Awards. By God, they were right. The picture [The Lost Weekend] carried off four Awards. Otherwise it would have been a wake. I thought of the sixteen years since I had first seen Sunset Boulevard, in 1930, when all I had was curiosity and not much purpose, when the world seemed one big candy box, and suddenly I hit the chauffeur on the shoulder and told him to go out on Sunset to the bridlepath and stop near Hillcrest. We could come back to La Rue's later. "But, darling," cried my wife, "You mustn't. They're all waiting for you back there!" "It's all right, dear," I replied. "There's something I want to do first. It'll only take a couple of minutes." When the car stopped at Hillcrest I got out, and with the golden Oscar in my hand, I walked to the edge of Sunset and looked down at the lights. They seemed very bright that night. After a few moments I quietly said, "Mr Novarro. Tonight they belong to me!" Allow me sum up this daddy/daughter/future son scene from Lovers Courageous: "Marry this loser and you're on your own." Aviations & movies are getting together again for a three-day film festival this April in Dayton, OH. TiVo recorded an interesting film from the Robert Young library recently: Joe Smith, American. This flag-waver from 1942 takes you into the life of a Lockheed factory worker who gets kidnapped by Nazi agents. Joe Smith is doing pretty well - has a wife, son & a home. After a mysterious, and rigorous interview by HR and government agents, he gets promoted to the Norden Bombsight department where he's one of a few trusted to install it on bombers. The next thing you know, Joe's being chased by a mysterious car and he's kidnapped. While Joe is interrogated by the thugs, he thinks to himself, keeping his cool and thinking happy thoughts: meeting his wife, his son's birth, etc. The strongest part of the story is hearing Joe remember the subtleties of his kidnapping: sounds of the car ride, the feel of a hub cap, how many turns the car made, how many stair steps, the ring on someone finger, the scratch on a door, etc. It comes across as a guide for what to do if you're kidnapped and want to catch the bad guys later. From what I've read, Joe Smith & family were reincarnated for 1950's The Next Voice You Hear. I've seen the movie and vaguely remember the familiarities. Next Voice has a ton of potential: God broadcasts messages over the radio every night at 8 p.m. You really want to get wound up for some sci-fi-ish action with James Whitmore as Joe, but nothing really happens. After reading this blog post on Movie Morlocks, I just had to make mention of it over here. 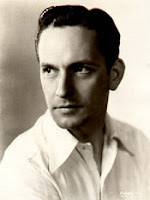 Pure, unadulterated fangirl writing on Fredric March. A refreshing read on this blah Tuesday. Yep, it's Valentines Day week. Time to scramble to Walgreens, pick up a cheap box of Whitman's and proclaim your love (for your sweetie silly, not the chocolate). I sound real romantic, don't I? I'm not a big fan of the day, but I thought it would make for a great photo theme week here on the blog - stars I love to watch. Sneaking into the Admiral's party - a scene from Shipmates, 1931. Because you don't have enough to read: A new Joan Crawford book is coming out Feb. 12 - Not The Girl Next Door: Joan Crawford, A Personal Biography by Charlotte Chandler. From the "Just Noticed" files: Lisa Burks' book on Franchot Tone is scheduled to be published in September. [Insert dance of joy here]. Can someone shut off the snow over here? A scene from But the Flesh is Weak - Max Clement woos the rich Lady Joan Culver at the Opera. Paired with Bob for this film were the fairly unknown actresses Nora Gregor (Rosine) and Heather Thatcher (Lady Joan). The guys were a bit more familiar - C. Aubrey Smith, Nils Asther, and Edward Everett Horton.